The 24-year-old record producer came in at number 29 on the "annual ranking of the most influential young people in business", made up of "disruptors, innovators, rebels and artists". Emmanuel Macron, the 39-year-old President of France, took the top position on the list for being the youngest leader in France since Napoleon, while 33-year-old Facebook founder Mark Zuckerberg came in second for the continued success of his social networking site. 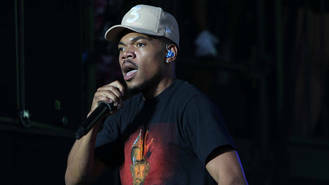 Chance the Rapper made it onto the coveted list for "subverting the music industry's traditional business model since he was a teenager, declining to sign with a major label and instead releasing his own streaming-only mixtapes, featuring unique strains of hip-hop splashed with sunny spirituality." The No Problem rapper received seven Grammy Award nominations and three wins for his streamed-only album Coloring Book earlier this year, as well as receiving $500,000 (Â£390,000) to debut tracks exclusively on Apple Music. The record featured guest appearances from Kanye West, Justin Bieber, and Future; as well as the single No Problem, starring Lil Wayne and 2 Chainz. Chance, whose full name is Chancelor Johnathan Bennett, also has number of endorsements from high profile brands including Nestle, Nike and Twitter. Former U.S. President Barack Obama is also a fan and praised the rapper's work in the community when he headlined a gig in his hometown earlier this month. "Chance, I'm grateful for everything you've done for our young people back home, representing the kind of young people that come out of Chicago and change the world," Obama told Chance.